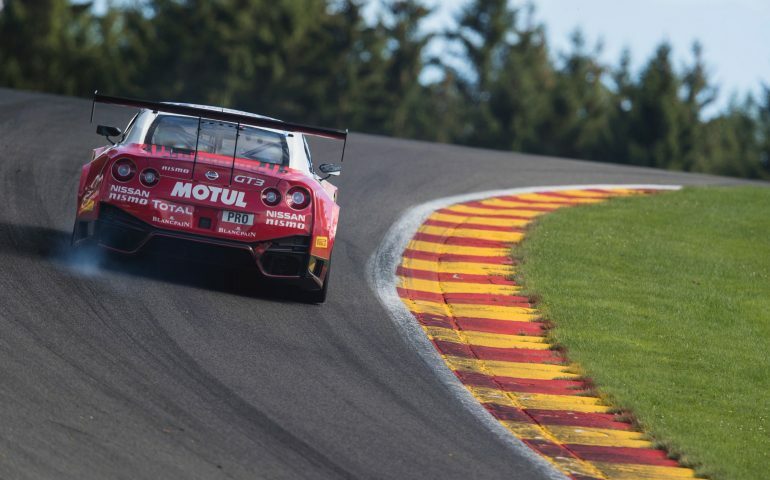 It was a race weekend that included many highs and lows, but after 24 consecutive hours of racing, Australian GT Academy driver Matt Simmons helped the #22 Nissan NISMO GT-R GT3 to the finish line at the famous Spa Francorchamps circuit in Belgium. It was a difficult start to the weekend for Simmons and his team-mates Matt Parry and Struan Moore after Parry suffered an ill-timed tyre failure at the infamous Eau Rogue corner, hitting the barrier at over 160 kmh. The car was badly damaged in the incident, forcing the RJN Motorsport crew to prepare the team’s spare chassis to get the #22 entry back into the race. Using the spare chassis was deemed outside of the sporting rules, however race officials allowed the newly-prepared GT-R the opportunity to compete, with an additional two minute pit lane penalty to be completed after the race’s official start. The entry’s fortunes went from bad to worse, though, when a fuel valve issue saw the #22 stranded on the circuit. By the time the car was retrieved, fixed and served its penalty, 30 minutes of the race had elapsed and hopes of a top result were over. Despite the hard luck, Simmons completed a number of long stints in the race, including a challenging drive when he was stuck on dry tyres on a rain sodden circuit. Simmons kept his cool to bring the car home safe and sound, with the trio eventually crossing the line in 30th place outright. “That’s what makes it so special – to finish this race means everything,” said Matt Simmons. “We worked so hard for the whole week and the whole 24 Hour race, so it’s just awesome to give that result to these guys. “I’m very thankful to have two finishes to my name at this event, but even though we didn’t get the results we wanted, we know that is what 24 hour races are all about. “I’m very happy. I’m sore and tired but I’m very happy. It was Simmons’s second attempt at the race, improving on his 37th place finish from 2016. The #23 Nissan NISMO GT-R GT3 of Lucas Ordonez, Alex Buncombe and Bathurst 12 Hour hero Katsumasa Chiyo finished 13th overall in a competitive showing. The final race of the 2017 Blancpain GT Series Endurance Cup will be held at the Circuit de Catalunya in Barcelona, Spain between September 30 – October 1.